The recent flurry of nationalist rhetoric in Bosnia brought to mind something I read a couple of months ago. In March this year, former Bosnian politician - now an analyst - Nenad Kecmanovic gave an extensive interview to Nova Srpska Politicka Misao. Excerpts from it have since appeared elsewhere, but the full article is not available in English. 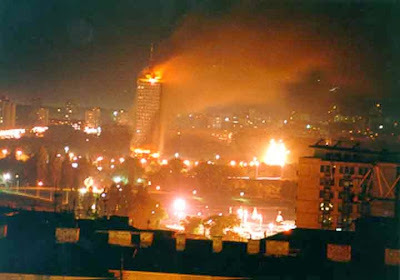 [NSPM] Contrary to the widespread thesis that Serbs and Croats are the main opponents of Bosnia-Herzegovina, your opinion is that Bosniaks [Bosnian Muslims] are the destroyers of B-H. What is the basis of your judgment? Kecmanović: If you have a project you care about, but you cannot implement it without voluntary cooperation of two partners who are not interested, the only reasonable way is to try to persuade them, win them over. Bosniaks, who are precisely in such a situation regarding their desired integration of B-H and the position of Serbs and Croats towards it, are doing precisely the opposite. They label their partners - Serbs, but Croats as well - incessantly as genocidal, fascist war criminals and push them even farther from their project. [...] They simply do not want voluntary, equitable integration that would be achieved through democratic dialog, mutual concessions, compromises and consensus. What they want is a unitary, centralized state, dominated by them, that would be forcibly imposed on Serbs and Croats by the international community. NSPM: How much room to maneuver do Serbs and Croats have within that concept? Kecmanović: The right of their neighbors, as constituent people, not to accept their project the Bosniaks don't see as a right to self-determination up through secession, but only as the right to submit or simply leave Bosnia [emphasis added]. So that Serbs and Croats wouldn't have any illusions that this project might actually be beneficial to them, Bosniaks are already declaring themselves the "fundamental people," meaning the other two are not fundamental, but minorities, interlopers, afterthoughts. Their language, invented like the name of their ethnicity, is called not "Bosniak," but Bosnian, in an effort to impose it as the only official language simply by its name. Their historiographers and publicists glorify Ottoman occupation as a Golden Age and a period of tolerance towards Christians, and invent their aristocratic genealogy. Naturally, this provokes in their Christian neighbors the collective memory of centuries of occupation and Turkish atrocities. On top of all this, they still live in a conviction that, unlike Serbs and Croats, they bear no responsibility for the war, that they were solely the innocent victims, that they killed their neighbors only in self-defense, that only their national movement was not chauvinistic, that Izetbegović was the leader of all Bosnians, that with him they were building a civil society and defended multiethnic tolerance, that the mujahedeen came from somewhere out there, that their connections with Islamic terrorism are malicious fiction, that they embody the values of democracy... and that for all of this, of course, the West simply idolizes them.